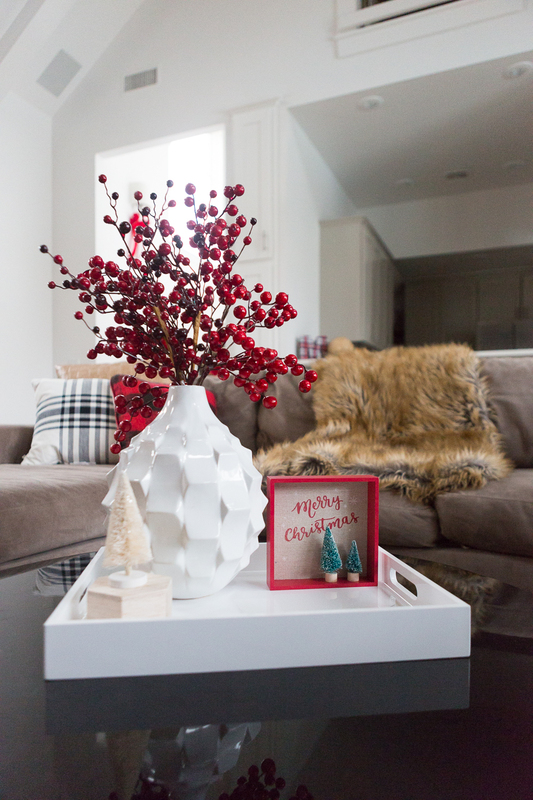 Hello and Welcome to CC and Mike’s where we are inviting you into our home for our Modern Eclectic Christmas Home Tour. If you are heading our way from Doreen’s blog, welcome! 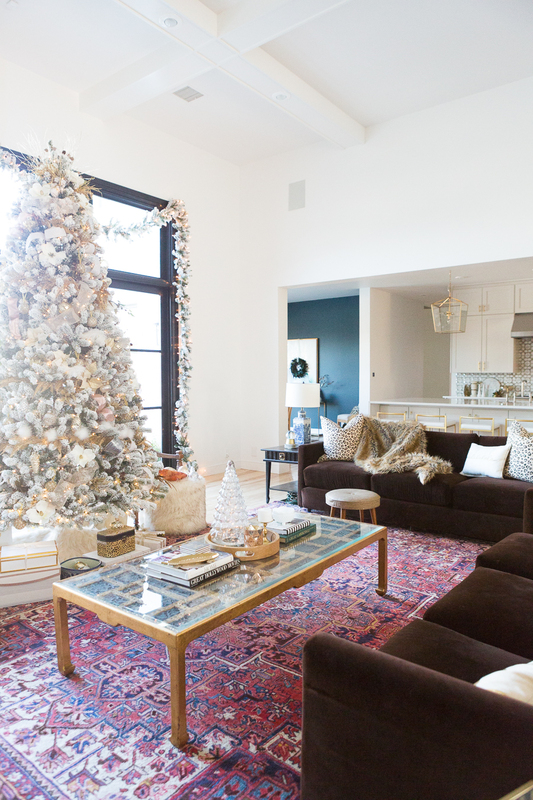 Isn’t her home an absolute dream dressed up for the holidays?!? It’s such an honor to be a part of this tour with so many incredibly talented bloggers. 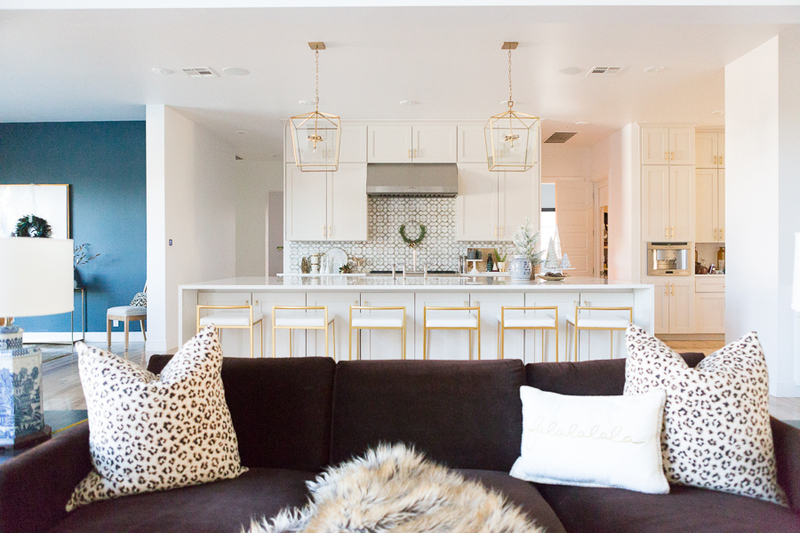 Make sure you stop by all of these blogs as well to get tons of inspiration for your homes. At the end of this post I will direct you to my friend Ashley’s blog so you can continue on the tour! 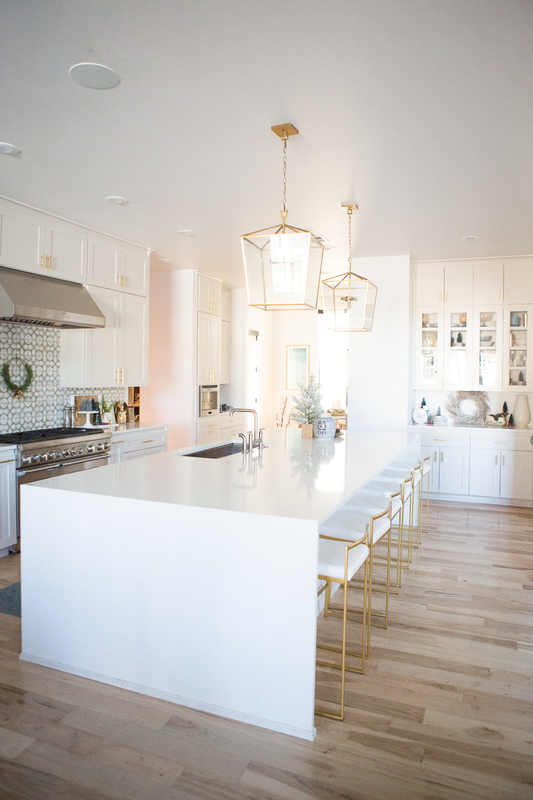 Here are all the amazing design bloggers participating in the tour! 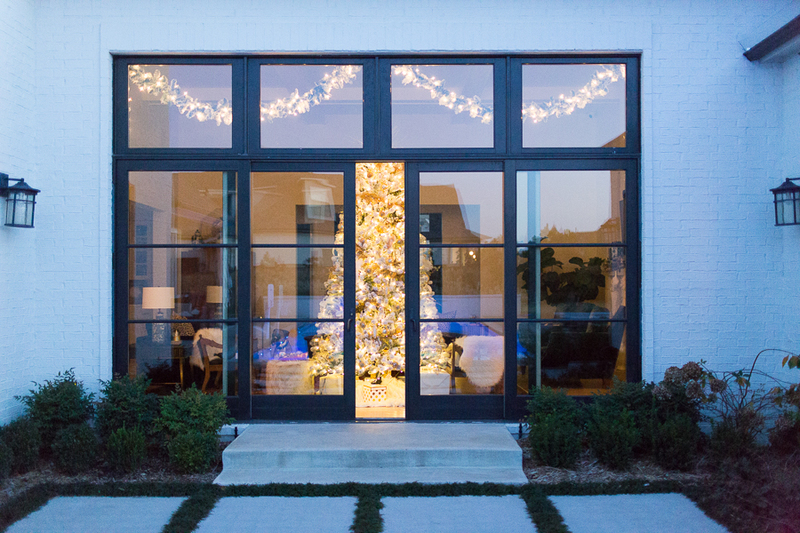 So what exactly is a Modern Eclectic Christmas Home Tour? I’m so glad you asked. I’ve been struggling to define my design style so I called in a friend for help—my girl Betsy from Little Design Co—and asked her how she would describe my design style. 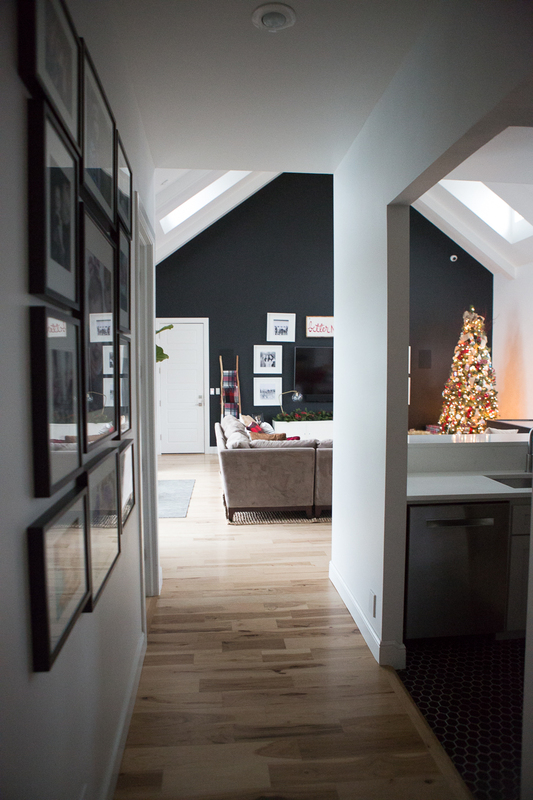 This is what she said: Modern Eclectic or Transitional. 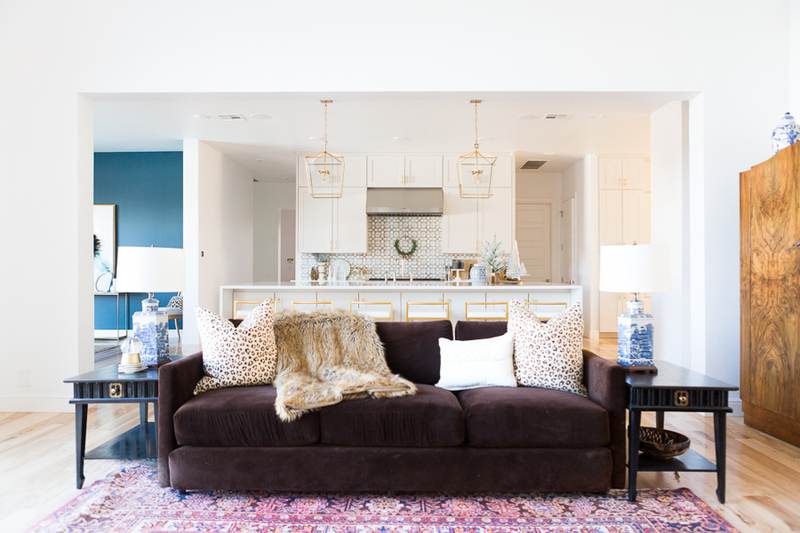 So, I looked them up and found an amazing definition from Apartment Therapy for modern eclectic decor — a decor that comprises heterogeneous elements — a mixture of textures, time periods, styles, trends, and colors. 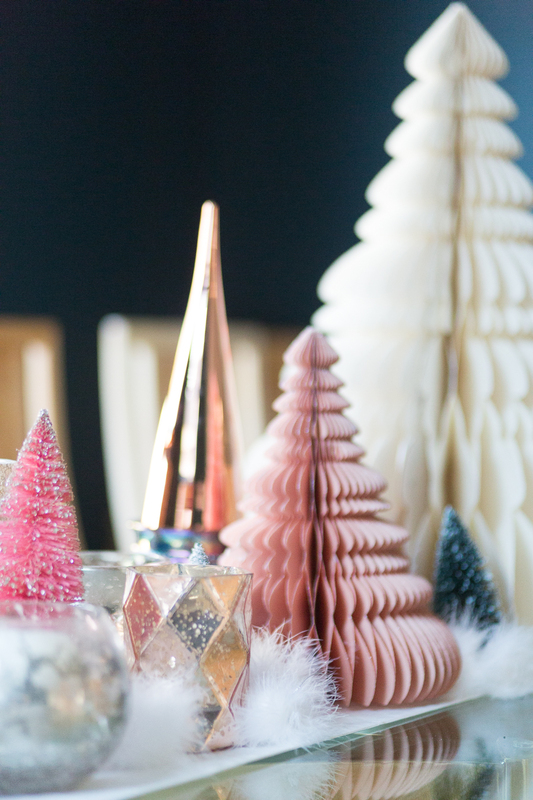 … Yep, that’s me and that’s how I would describe my Christmas decor. It is a mixture of new and old, a blending of time periods, styles and trends, and most importantly, I USE COLOR. And leopard pillows from Betsy’s shop. If I could have two things in every room during Christmas it would be fur anything—like my fur stools— and Betsy’s leopard pillows. 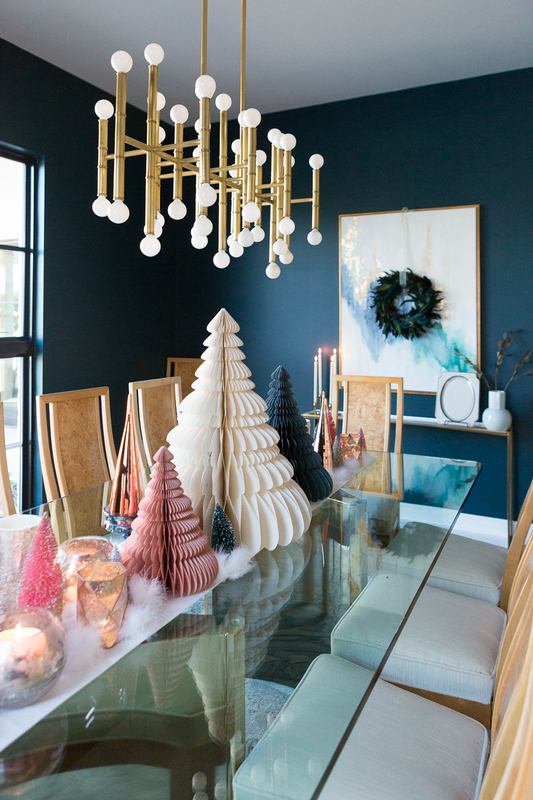 Ok that being said, I would like to welcome you to our Modern Eclectic Christmas tour: Notable mentions are our Dining room which had a recent redo where we painted the walls a dark and dramatic blue/green color that I’m obsessed with called Benjamin Moore Dark Harbor. 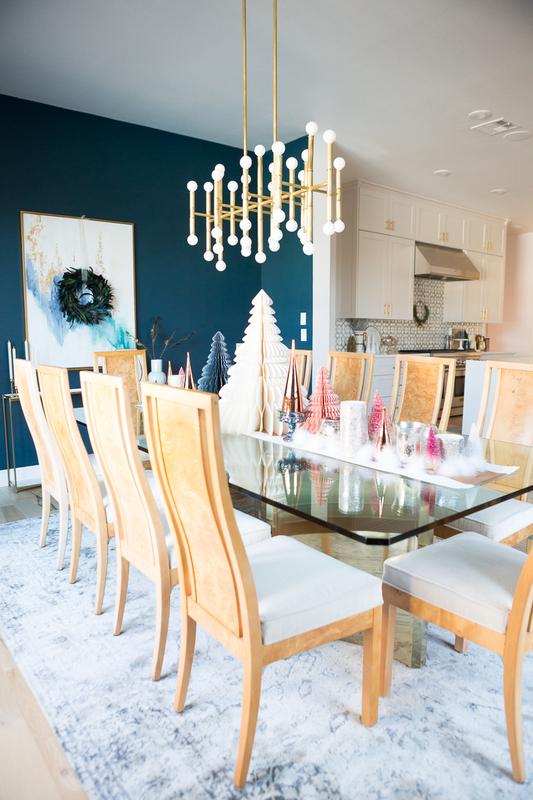 If you haven’t had a chance to see our full Christmas dining room reveal with all my favorite holiday products from West Elm (including their ridiculously amazing gold candlesticks, accordion trees, mercury vases and fur garland), you can read that post here. 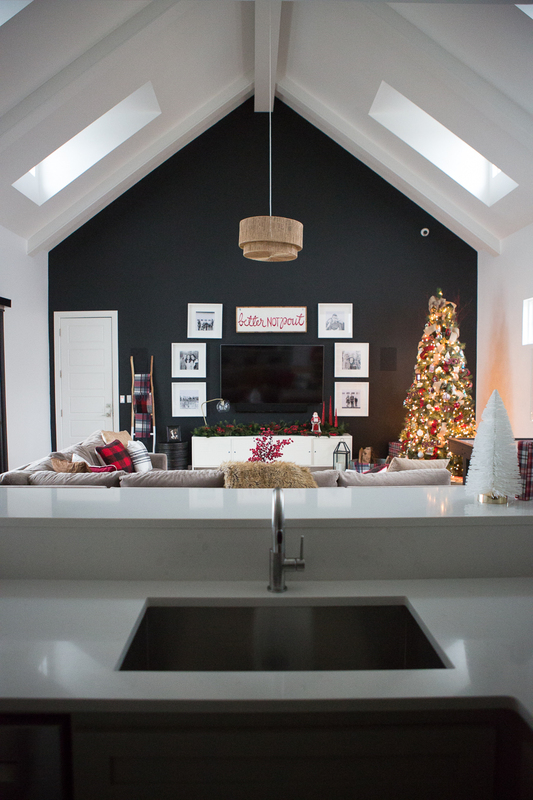 We also recently redid our game room and painted one wall a dramatic color called Black Satin by Benjamin Moore. 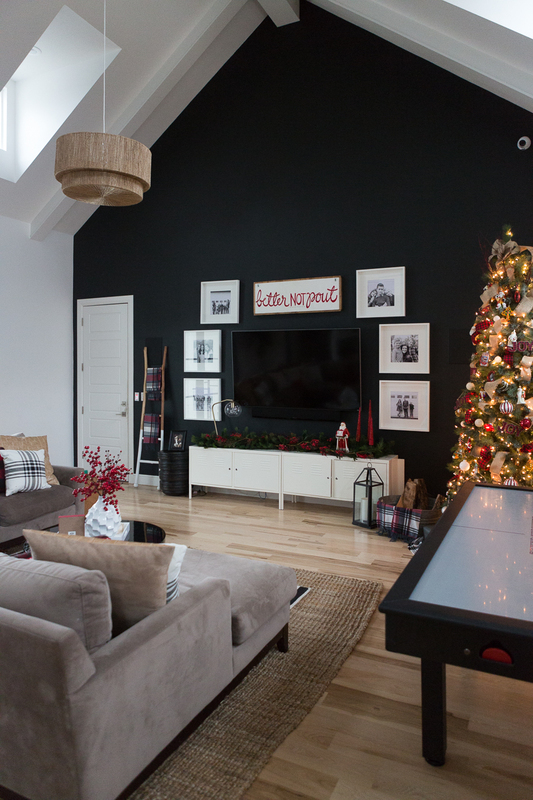 I am really excited to reveal that room for Christmas because it was so fun to dress it up in traditional Christmas colors and buffalo check and plaids that I can’t use in my main rooms. 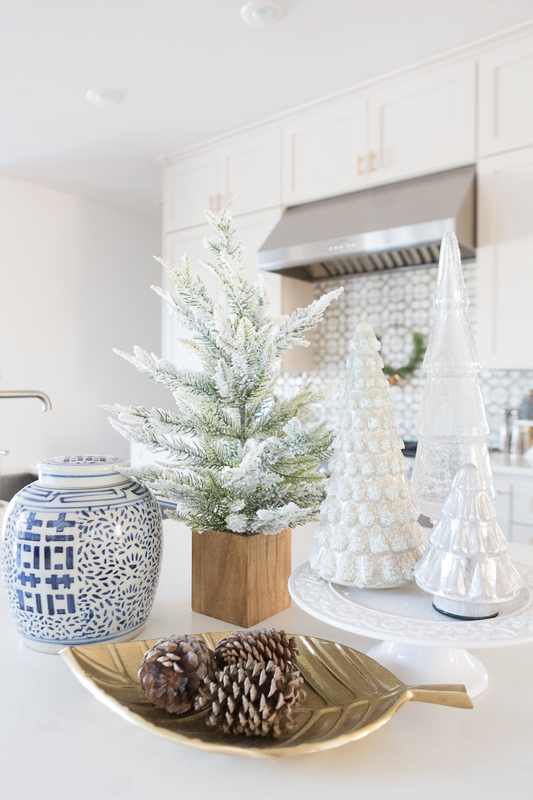 For this tour, I would like to welcome you into our kitchen, living room, dining room, master bedroom, and game room, and talk about my favorite products (new and used) that I used to create this Modern Eclectic Christmas look. First of all, we have to talk about King of Christmas. 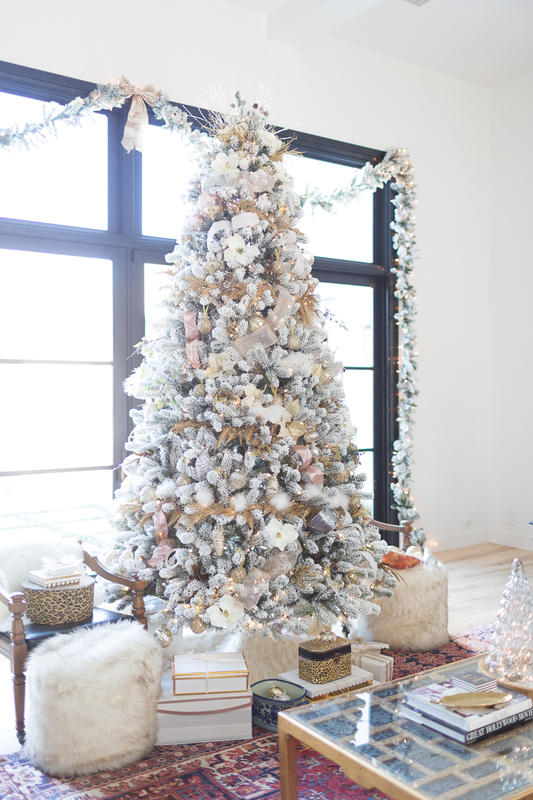 You guys, I’ve been dreaming about a flocked Christmas tree and my dream has finally come true! 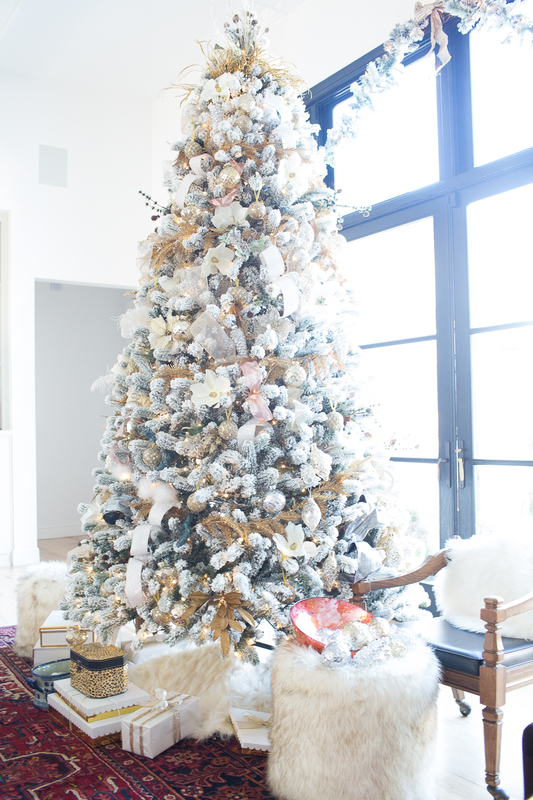 The tree you will see below as you enter our home is the 10 foot King Flocked Tree from King of Christmas. Yes, it is worth every penny of the investment. Let’s just put it this way…Mike Miller is normally, shall we say—unmoved—, by anything design related. 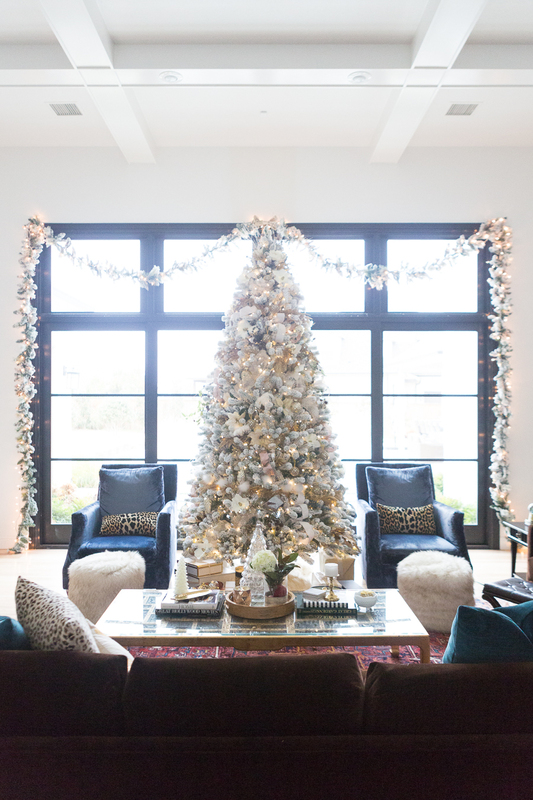 This tree had him all eyes open, jaw dropped, singing it’s praises, saying, “WOW.” It’s a statement maker; it’s the focal point of our holiday decor; we rearranged our entire living room so that this is the first thing you see when you walk into our house. 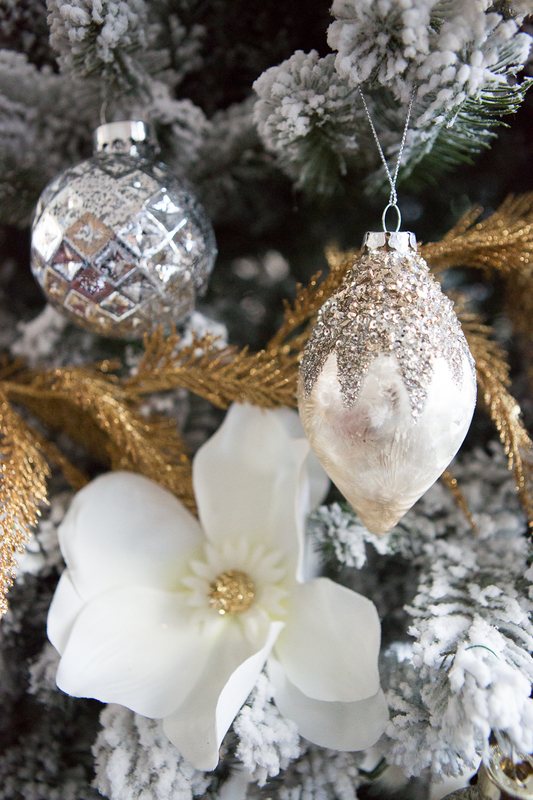 You can shop our favorite Christmas products here. 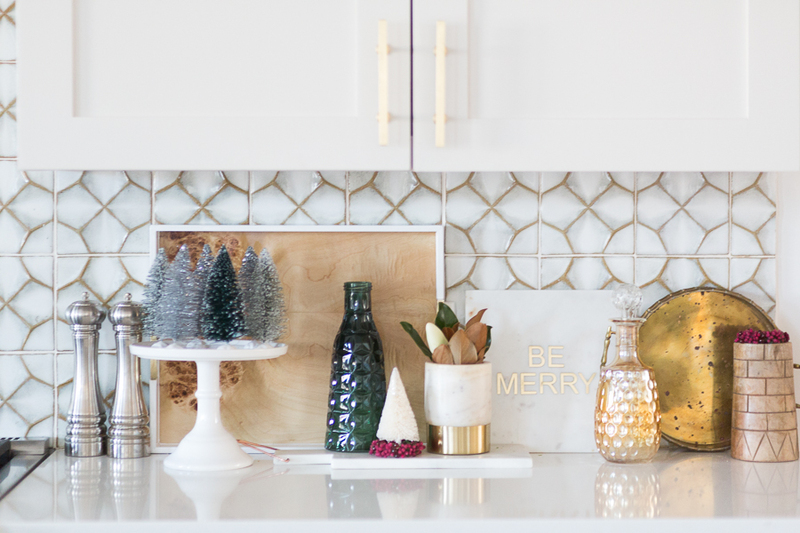 And don’t forget to check out our post on 21 Easy Christmas Decor and Gift Ideas from West Elm as well as our Holiday Gift Guides for Everyone. 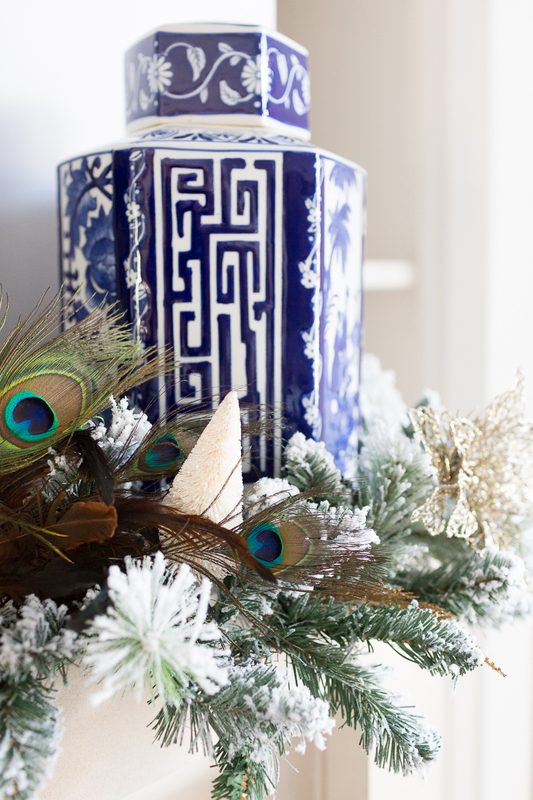 Like my touches of glam in my holiday decor? It’s all about gold, fur, and leopard. Get the look here. 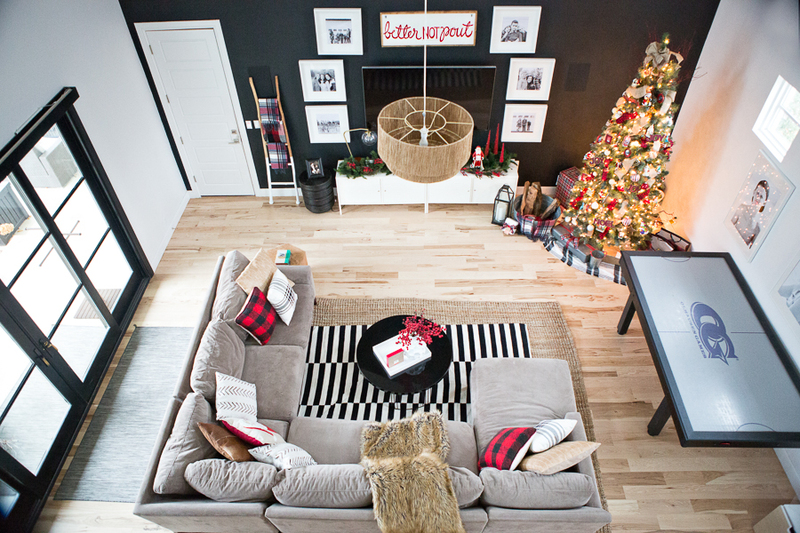 As I said earlier, I give you our Modern Eclectic design style is characterize by a blending of the old (our chocolate velvet living room couches are my husband’s from the 1970’s and I had the recovered) and new (our king of Christmas tree and my favorite crushed velvet chairs); old (our resourced burlwood chairs from the 1970’s that I got from Scout Design Studio) paired with the new (gold statement chandelier in our dining room). I could go on and on. Our entire house is filled with old and new and I love that! Many items in our house are thrifted our repurposed and some are new purchases. I would say that blending of textures, time periods, styles, and colors is what I love most because it gives character! 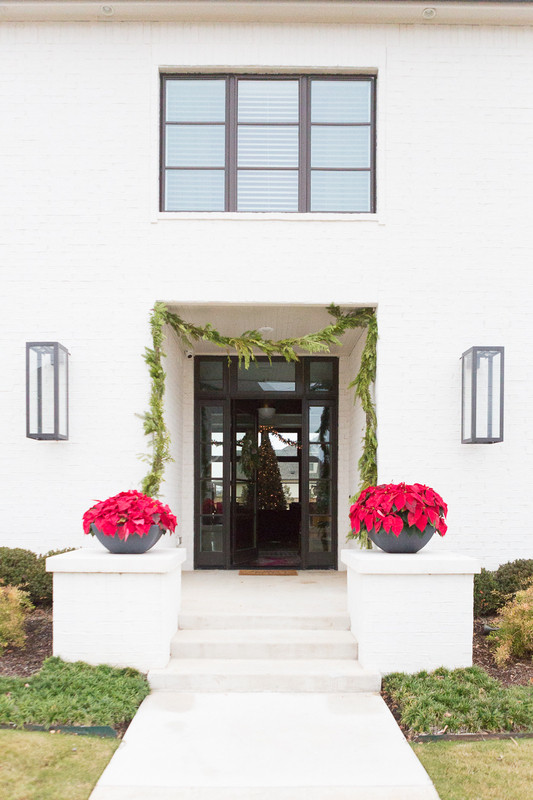 You can shop our entryway here. 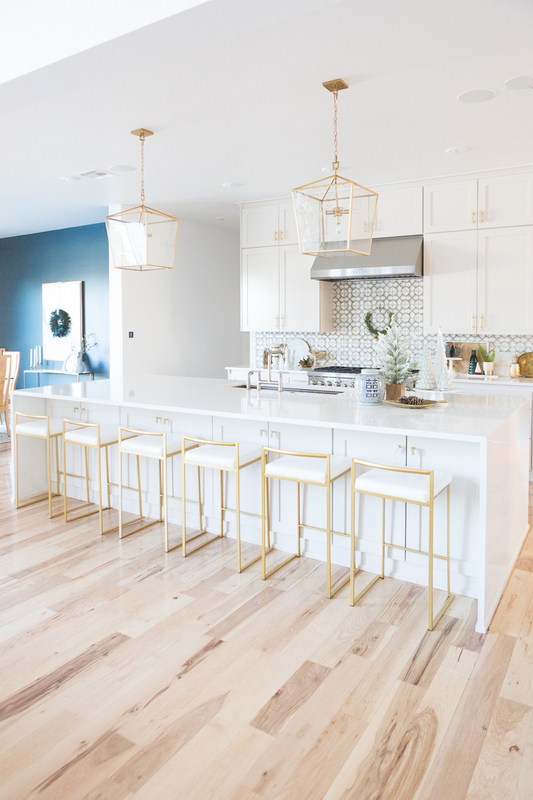 Our kitchen and Living Room Products are listed below and if you scroll further down the post you will find sources for our gameroom and master bedroom. 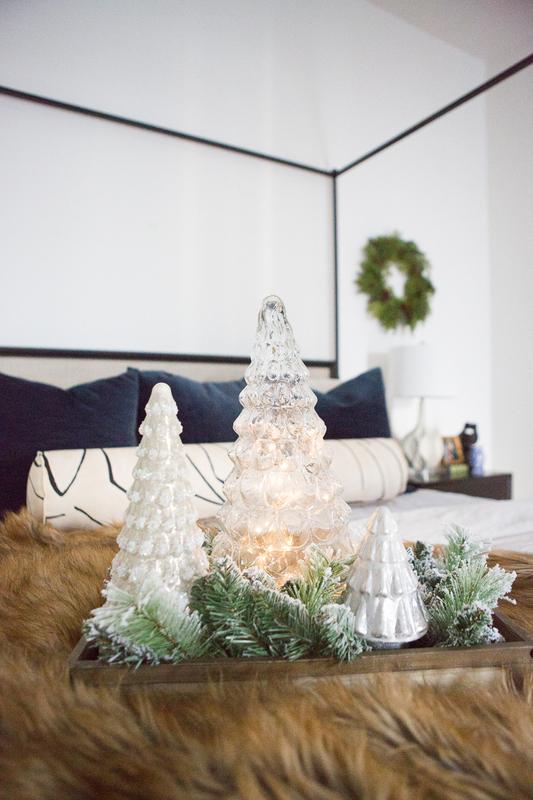 Shop our master bedroom here. 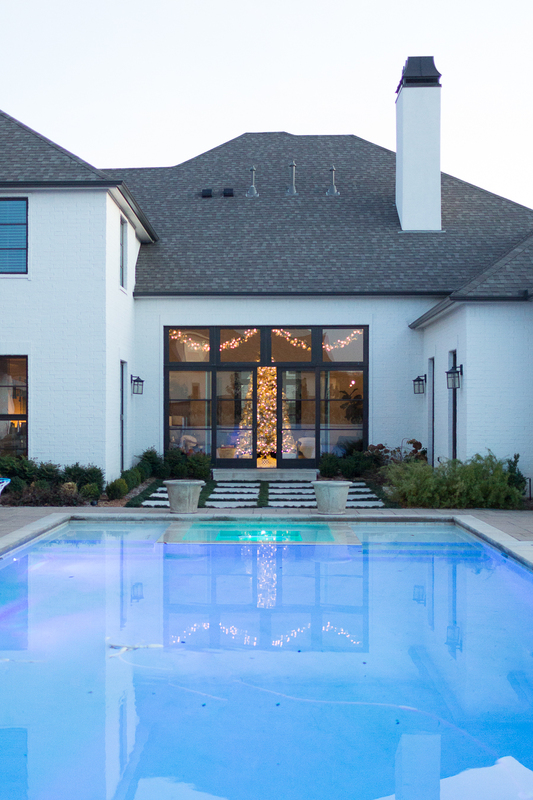 We hope you enjoyed taking our Modern Eclectic Christmas Home Tour. We are so glad that you stopped by! 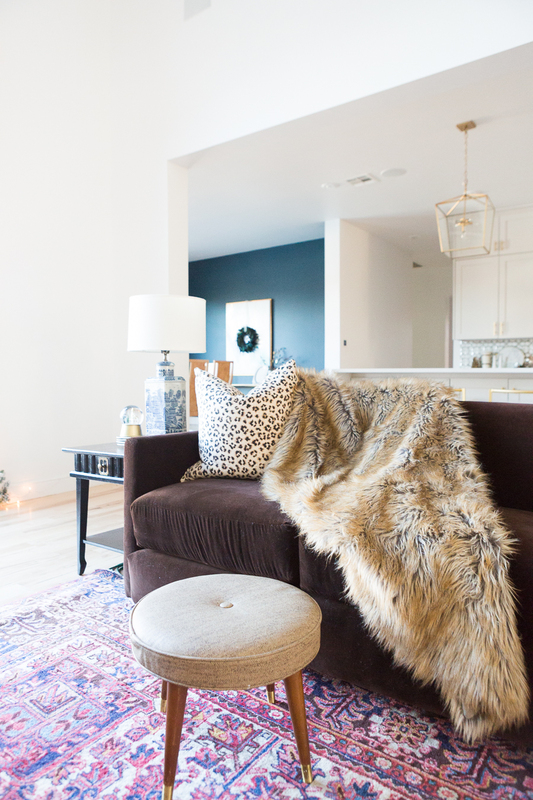 Please head on over to my friend and fellow Oklahoma girl Ashley’s blog now — Curls and Cashmere. 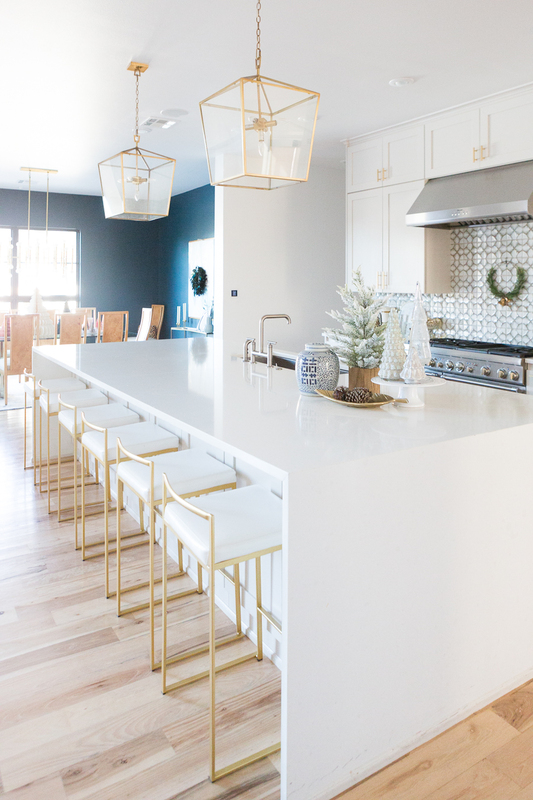 You guys, her home is a dream and you are definitely going to want to see it all decked out for Christmas. Loved your decor Carissa!! 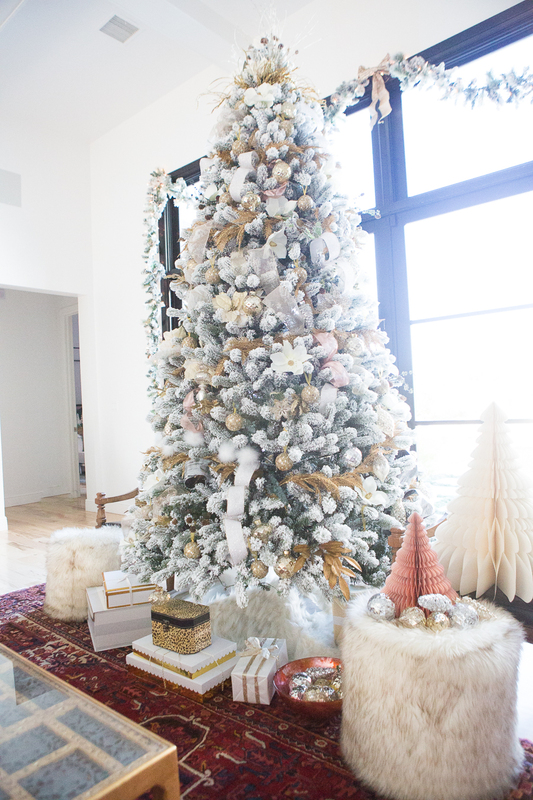 And I’m so jealous of your gorg flocked tree! 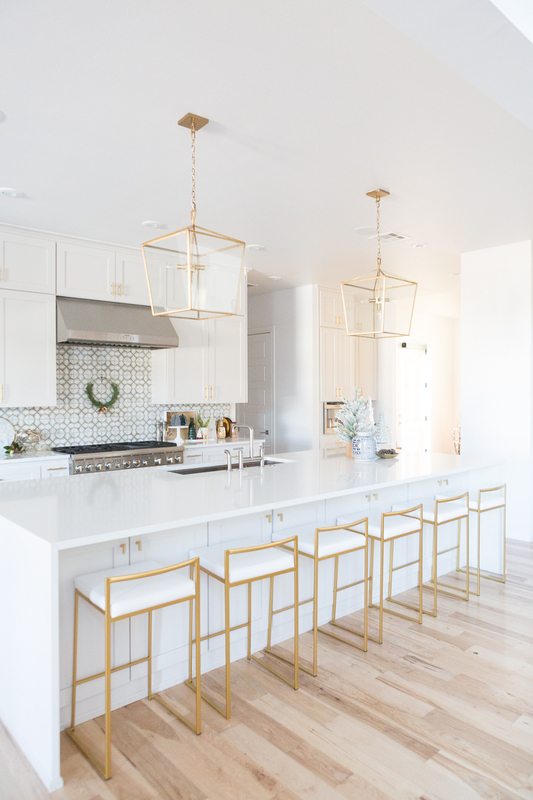 I’m so envious of your kitchen backsplash too! Merry Christmas! Love everything you guys do!! The entry hall is particularly fabulous!! !